I am going to admit that I did not know much about Bill Sienkiewicz until I began researching the New Mutants. When the New Mutants film was announced and they started to go for a horror theme and Josh Boone the film's director began talking about the art of Sienkiewicz in the New Mutants as a major influence in the film. I read that and realized there was a major piece of comic history. So i went to the comic store found the old New Mutants #18-31 and #35-38 bought them and read them. Josh Boone was right. The New Mutants run is meaty, there is nothing cozy or typically archetypal. I found there to be something very different, very intelligent and existentially raw in those books. The art is cerebral, and intimate. Thoughts and emotion were twisted and toyed through the use of color and expressionism. Definitely it was a case of writing and art coming together to do something very unique. Basically what happens when comic books as an art form are operating on their highest levels. Really the only thing that really gave me the same feel that Sienkiewicz's New Mutants art did was the series Wytches written by Scott Snyder with the crazy and amazing art done by Jock. Which if I am making you curious, is another series you check out. After that I had officially drank the proverbial Bill Sienkiewicz koolaid and have been paying attention to his site and art when it comes out. He has done a lot of interesting things over the years. 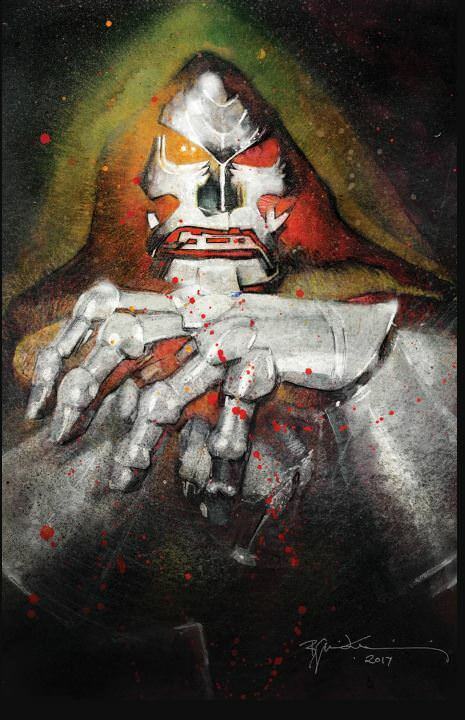 Which bring us to this moment Bill released an image of a variant cover of Fantastic Four #1 featuring Doctor Doom. That really caught my eye. An iconic artist and his take on the world's most iconic villain. The cover definitely has all the expressionistic art qualities one would expect from Sienkiewicz. I tend to think this is going to be a very hot book. There are only going to be 1,500 printed with this cover and they will all be sold through his website. You can purchase the unsigned version for $20 dollars and the signed version for $50. Introducing the first Bill Sienkiewicz exclusive comic, only available through Bill Sienkiewicz Art! 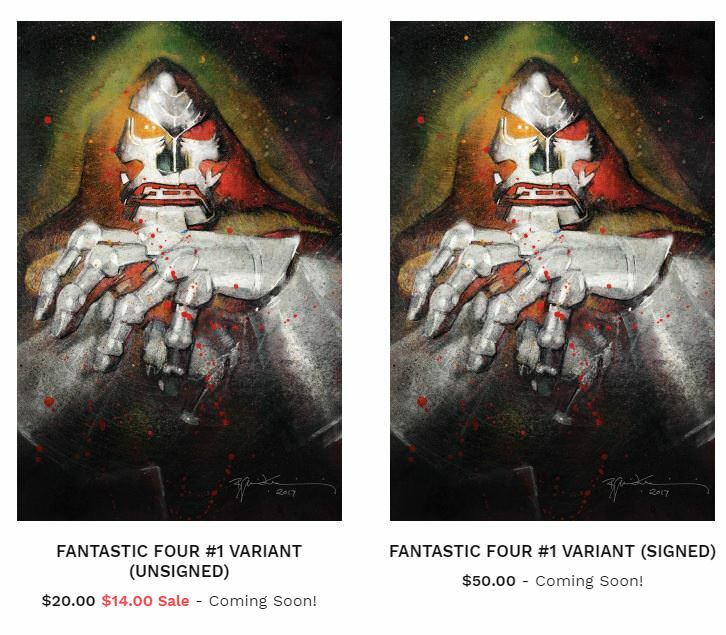 This Fantastic Four #1 variant cover features a portrait of the FF's arch-nemesis, Doctor Doom. Signed by Bill Sienkiewicz.